Dr. Rock's Blog & Roll: Album of the Day: The Monkees (11/14/67) 42 Years! Album of the Day: The Monkees (11/14/67) 42 Years! 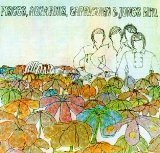 The Monkees’ fourth album, Pisces, Aquarius, Capricorn & Jones Ltd., was released on November 14, 1967. It’s one of the best pop-rock albums of the 60s. But mention the Monkees and most people think of the wacky TV show, the “band” manufactured specifically to star in the show, and the string of mid-60s upbeat, pop-rock tunes that were credited to the Monkees but on which none of the band’s members supposedly played any instruments. That’s only partially true, but the depth of the contributions by Mike Nesmith, Micky Dolenz, Davy Jones and Peter Tork is always lost amidst the derision from many critics and purists to the “Pre-Fab Four.” Yes, they had little artistic control and musical effort in their first two albums, but they demanded and one freedom for their third release, Headquarters, in May 1967, writing half the songs and playing all the music themselves. And on Pisces, Aquarius, Capricorn & Jones Ltd. they were so confident that they featured mostly covers on the album’s 13 original cuts and actually invited studio musicians to supplement their own musicianship. Never sell the Monkees short. Pisces, Aquarius, Capricorn & Jones Ltd. is a great album with a mix of styles (reflecting the disparate musical interests of the individuals). It was the fourth #1 album in less than 14 months for the band, and represents the only time in music history that all of any band’s first four albums went #1. Not even the real Fab Four can say that. Pisces, Aquarius, Capricorn & Jones Ltd. is available as download tracks from iTunes (click here) and as a CD from Amazon (click here).